William “Bill” Wesley Sanderson, 76, of Salina, passed away Monday, May 15, 2017. He was born May 17, 1940, to Thomas “Wes” Wesley and Elma “Betty” (Remitta) Stauffer Sanderson in Salina. As a young boy, Bill lived in New Cambria for a few years. The remainder of his young years and growing up years were spent in Salina. After 17 years of fighting leukemia, Bill said that’s enough and passed through the pearly gates and was met by his Lord and Savior along with his parents and infant twin brother. After fighting leukemia those many years, he never once said why me, but took up the yoke and fought the hard and long battle until his death. Bill was a very caring and gentle man and will be ever so greatly missed. 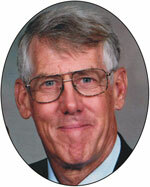 Bill graduated in 1958 from Salina High School. Bill also was a graduate of Brown Mackie School of Business. On Sept. 25, 1965, Bill was united in marriage with Karen Elaine Cooley, of Plainville. To this union, they welcomed three sons, James, David and Nathan. Bill and Karen were able to celebrate 28 years of marriage before Karen made her heavenly journey through the pearly gates in 1994. Bill was employed for 35 years with the City of Salina in the Water Department, as a faithful water meter reader, all the while being a hobby farmer and keeping honey bees. Upon retirement, Bill became a full-time farmer and spent many hours among his cow and calf herd and in the fields. As his sons were growing up, Bill and Karen enjoyed attending the many sports which his sons loved to play. As the grandchildren came along, Bill and Lucille attended their games, cheering them on. Grandpa’s eyes sparkled as they attended the grandchildren’s games, no matter what the sport would be. On April 9, 1999, Bill and Lucille LaOrange were united in marriage. With this marriage, a family of Bill’s three sons grew into a family of five, adding Lucille’s two sons, Mike LaOrange and Tracy LaOrange. “The boys” were a great help to both Bill and Lucille when their help was needed. Bill and Lucille were able to fulfill their desire to see Alaska and Washington, D.C., and a slow gentle trip down the Mississippi River. Many other trips were spent with families. As his health declined, they enjoyed just staying home. Bill and Lucille were able to remember the good times and make the trips in memories once again. Bill was raised in St. John’s Lutheran Church and later became a member of First Christian Church. Bill was a member of Sunflower Lion’s Club, joining in 1992. He was preceded in death by: his parents; grandparents; baby brother Sanderson; brothers-in-law, Robert Dombroski, and George Alan Jerby; one niece; one nephew; and hosts of aunts and uncles. Left to mourn his passing are: his wife, Lucille, of the home; sons, James Sanderson, of Topeka, David Sanderson (Bonnie) and Nathan Sanderson; stepsons, Mike LaOrange (Sharon) and Tracy LaOrange (Brenda), all of Salina; grandchildren, Levi Sanderson, Owen Sanderson and Holly Sanderson; seven stepgrandchildren; great-grandchildren, Kaelynn Sanderson and Brooklynn Miller; 11 stepgreat-grandchildren; sisters, Dorilda “Anne” Kresin (Ralph) and Bette Jane Thorell (Dennis); sisters-in-law, Virginia “Ginny” Jerby and Janet Dombroski; many nieces and nephews; and a host of cousins. Visitation: 4-8 p.m. Thursday, May 18, at Ryan Mortuary, Salina, with family present from 5-7. Funeral service: 11 a.m. Friday, May 19, at First Christian Church, with burial to follow in Roselawn Memorial Park. In lieu of flowers, memorials may be made to: Tammy Walker Cancer Center or Hospice of Salina, in care of Ryan Mortuary, 137 N. Eighth, Salina 67401.